I frequently use Quikr for selling and buying used products. As a seller, one of my pet peeves is receiving too many inquiries about the product. Sometimes I end up getting unsolicited calls from people who wish to discuss everything but the product. The flip side of sharing your number with a larger audience on Quikr is that you unintentionally become a soft target for spammers. Thankfully, you now have Quikr Nxt, a safe haven for both buyers as well as sellers who can connect with each other through Chat without having to disclose their numbers. This new feature is available on Quikr's mobile application and its desktop and mobile sites. A smart move by Quikr I'd say, considering they are aiming to transform India's online classifieds market. No longer do I need to worry about unsolicited calls or fake callers ... I can now communicate with genuine buyers with ease. From a buyer's perspective also, this feature is effing cool as they can request more details about the product or service over chat without having to physically dial a number. 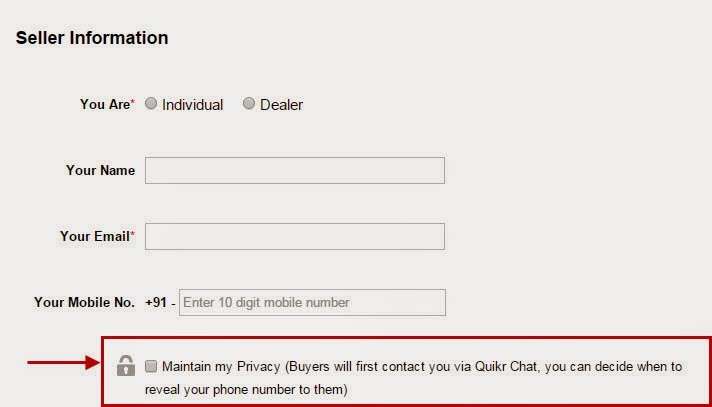 Quikr Nxt assures complete privacy of your number. Since the focus has shifted from call to chat, you are more likely to interact with prospective buyers or sellers with no apparent need to reveal your number. The process to keep your number private is such a breeze. In the Seller Information section, tick the Maintain my Privacy box. That's all it takes! Go ahead and post your ad without any hesitation. Your number is now private! The best part about this new feature is that it allows you to open up a dialog with multiple prospects. You have a better choice of deciding who you want to sell your product to or who you wish to purchase from. With Quikr Nxt, you can also keep a track of all your chats. The past chats are archived and available for easy reference whenever you want. You don't need to remember a thing! You no longer have to wait to share the minutest details of your product via email or phone. Send as many photos as you want to using the Quikr Chat. Quikr Nxt takes away a lot of headache of dealing with unsolicited calls and ensures smooth selling and buying via chat.